So I love black Friday and cyber Monday as much as all of you, who doesn’t want a great deal? I’ve had a fantastic year this year and to show my appreciation I’m doing something I have never done and that’s offer a gift certificate special. 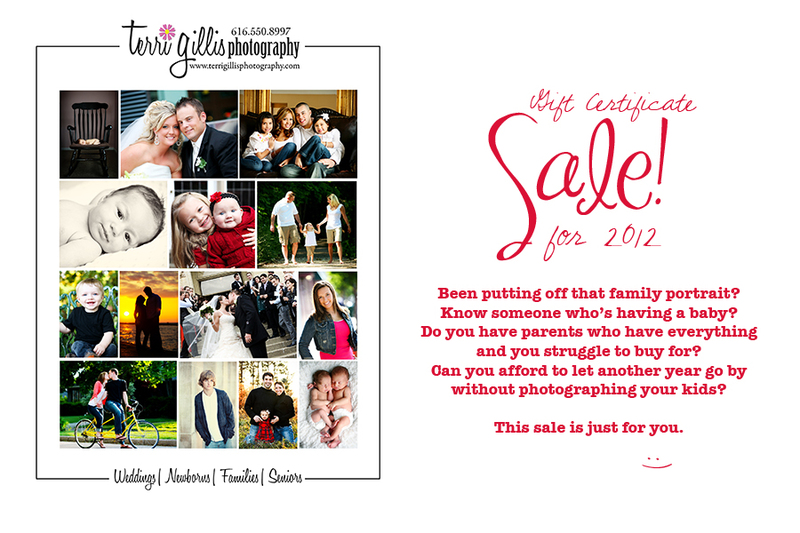 I’m offering 4 gift certificate options for 2012 sessions from now until 11:59pm on 11/28/11. Each certificate is discounted $50! If you’ve been neglecting getting your family photo done or you know someone who is having a baby, this is a gift you or your loved one will absolutely love, long after your iPad2 has passed. I recently read a post on why people put off getting their family photo done, 2 reasons….1.) the same old excuse….I don’t like how I look, I hate my hair, I need to lose weight….2.) $$$. Let me address both of those…I love every photo I have of my parents as well as my husband’s family. I’ve asked a few people recently…”Do you ever look at your family photos and say…I would love this photo if only my mom was a little thinner or her hair styled differently?”…Isn’t that ridiculous? of course not!! ….Secondly, my clients who have said to me….”when we first getting our kids photographed it seemed expensive and we weren’t sure we wanted to do it, as our kids have grown we look back and are so happy we made this investment, they grew up so fast, we can’t imagine not having our photos. They’re memories we can’t afford to live without”. A to the MEN! It’s time people!! Commit to having fabulous photos in 2012! Gift certificate are available for purchase until 12/17/11 but only on sale until 11:59pm on 11/28/11. Certificates will be mailed directly to you but can be mailed elsewhere if you indicate that in your order. Sessions must take place before 10/1/12 and expire on 11/1/12 (because its just not pretty outside after that). Can’t wait to see your beautiful smiles in 2012!